Learn how to set up links and click actions to canvases or pages on your site. All elements in a Canvas can be made clickable with a variety of link types to choose from, as well as additional actions to control Canvases and Galleries. Page: Choose a page from your site to link to. Canvas: Choose a Canvas on your page to scroll to. If you’d like to define a specific Canvas View to display within that Canvas, choose that from the Canvas View dropdown. URL: Insert a web address to link to. Be sure to include http:// at the beginning of the URL. For example, www.example.com is incorrect, http://www.example.com is correct. Social: Choose a social media channel to share the page to. Email: Enter an email address to send an email to. SMS: Enter a mobile phone number to send a text message to. Be sure to enter the country code and area code, omitting any dashes and spaces. For example, a valid phone number in the US would look like 14803861337. This is most relevant to mobile design, as it will (in most cases) open the mobile user’s text messaging app with the number pre-filled. SMS: Enter a phone number to call. Be sure to enter the country code and area code, omitting any dashes and spaces. For example, a valid phone number in the US would look like 14803861337. This is most relevant to mobile design, as it will (in most cases) call the number from the user’s phone when clicked. WordPress Post (available in WordPress design templates only): Applies the appropriate direct into the full WordPress blog post or page. To set up a click action, determine the target page and/or canvas you want the element to link to. Setting up Click Actions to Canvases on the Same Page: If the canvas you want to link to is located on the same page as the linking element, set up the click action to Link > Canvas > "canvas name"
Setting up Click Actions with Site Canvases: Because Site Canvases are not inherently attached to a specific page, they need to be set up as if you are targeting a canvas on a different page as long as the target canvas is not a Site Canvas- Link > Page > Canvas > "canvas slug". 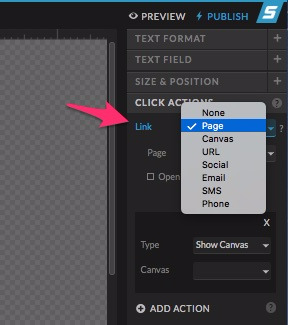 However, if you are targeting a site canvas you can set up the click action as Link > Canvas > "canvas name". Add an additional action to control a Canvas or Gallery on the page. These actions are used to reveal hidden canvases, hide visible canvases, or control gallery navigation. Show Canvas: This action type will cause the chosen Hidden Canvas to appear. Hide Canvas: This action type will cause the chosen Visible Canvas to disappear. Gallery: Controls the navigation of a Gallery on the page with previous/next options.